For a vehicle that can do it all, drivers can turn to the 2016 Toyota Tundra. Built with the strength to handle any task, challenge, or adventure that comes along, the pickup truck is prepared for anything the driver or road ahead throws at it. In addition to its powerful engine, the Tundra can tow like no tomorrow. But the heavy-duty workhorse can also earn up to an estimated 19 mpg highway fuel economy. Maximum power becomes available when drivers opt for the 5.7-liter i-FORCE V-8 engine. Capable of churning out 381 horsepower, the engine has no problem showing off its strength. 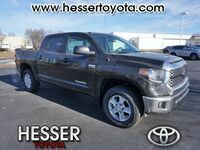 When the 5.7-liter V-8 engine is matched with the Tundra's TOW/HAUL Mode, the truck can tow over 10,500 pounds. You heard correctly - that's over 5.25 tons. 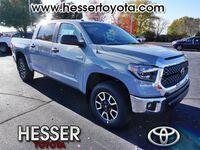 Available with three bed lengths, the Tundra gives drivers the choice of a 5.5-foot short bed for more cabin passengers, a 6.5-foot standard bed, and an 8.1-foot long bed for additional hauling space. The 2016 Tundra is available with two i-FORCE engines. The 4.6-liter V-8 generates 310 horsepower and up to 327 pound-feet of torque. 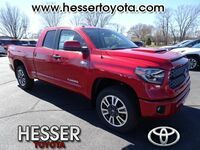 The Tundra's 5.7-liter V-8 can increase that strength up to 381 horsepower and 401 pound-feet of torque. 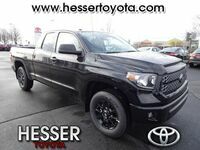 The latter also allows drivers to haul up to 10,500 pounds of additional cargo behind the Tundra. 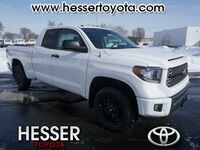 Experiencing that brute strength is just a click away when drivers schedule a test drive with the team at Hesser Toyota today.